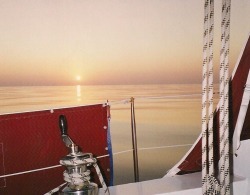 Becalmed in the Timor Sea. About 10 years ago I found Dicha lying abandoned in a Gran Canaria marina. 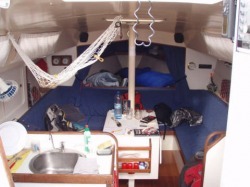 She was a homebuilt professional hull design from Van der Stadt. It took me nearly a year to finish her off, with all new rigging, new wiring, plumbing, new electronics, wind vane, auto pilot, radar, safety gear and new just about everything except the engines main block and the sails. 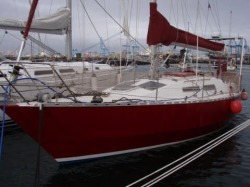 It cost me nearly as much to rig her for singlehanded offshore sailing as it did to buy her from a Dutchman. The route I took was the fairly well trodden westbound circumnavigation one, via the Panama canal and South Africa. I stopped in St Martin, Colon and Balboa in Panama, Huva Iva, Tahiti, Moorea, Tonga, Suva Bay and Vunda point in Fiji, Vanuatu, Cairns then day sailing inside the barrier reef to Horn Island, Darwin, Mauritius, Richards Bay, Durban, Port Elizabeth, Mossel Bay, Cape Town, St Helena, Cape Verdie Islands, El Heirro and finally back to the start point in Gran Canaria. For the final leg I decided to do something in terms of route planning that the books do not recommend for small yachts. I sailed directly from St Heléna via the Cape Verde Islands to the Canary Islands in February against a strong northeast trade wind and adverse current. 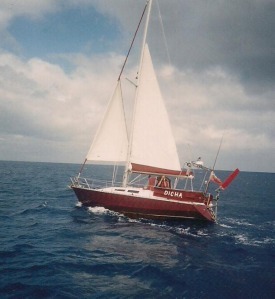 Dicha, her rig, engine, sails and self steering gear stood up to the 1000 mile battering to windward fairly well, but every other non essential system seemed to fail. Over the weeks the navigation light, windex and even the VHF aerial were shaken off the top of the mast. All the bulb holders for the deck level navigation lights corroded away from salt water, the magnetron valve in the radar was shaken apart, one of the two electric auto pilots failed, the towed water generator rectifier failed, a wave split the spray hood and a solar panel on the fore deck split. The day after I arrived home both main winches and the furling gear seized up as all the grease had been washed out and they were only in effect being lubricated by salt water. I did more damage and wore out more equipment in the last 1000 miles than in the entire trip round. Both sails stretched so badly they had to be re cut and re stitched, although they were nearly worn out. 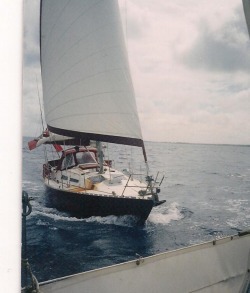 The corrosion damage to the furling gear, radar, solar panel and electric autopilot meant they were all beyond repair. The anti fouling paint had mostly fallen off and the bottom was covered in barnacles. The entire trip took 3 years, with about 1 year offshore and nearly 2 years in various bars or working on Dicha. I have promised all concerned in my family that I wont do it again, although I still think of the good times and forget the few bad ones. I gave up singlehanding and took up the easy life as first officer on Starry night, an Oyster 72 with hot and cold running everything, push button sail controls, fridges, freezers and every comfort in life for a year before getting too friendly with the German cook and moving ashore to the wonderfull world of airships again. Written by the owner and director of HPS Ltd.
DICHA my 34ft steel Van der Stadt in Puerto Mogan. The main cabin with a few onions in the net. Entering Richards Bay South Africa, photo from local tug boat. 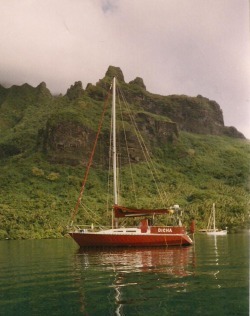 Anchored in Cooks Bay Moorea. 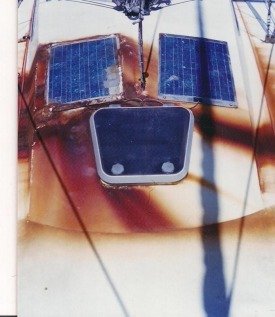 Rust stain on the foredeck from a solar panel. 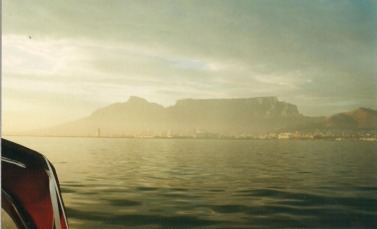 Approaching Cape Town in the morning. The rather exposed St. Helena anchorage.. 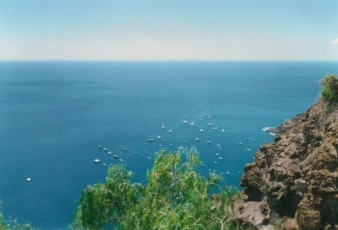 When I look at the picture of the South Atlantic from a hillside in St Helena, I know why I went. The big blue! I must go down to the sea again, to the lonely sea and the sky; I left my shoes and socks there - I wonder if they're dry?.